Elements Applied: Rootstock is commonly applied in herbal medicine. Used for: The herb is applied for relieving spasms, boosting perspiration and bile movement, fighting constipation, and inducing vomits. Black Root is applied to treat gallbladder inflammations and liver congestion. Black Root is specifically used to treat jaundice associated with liver congestion. Additionally, if you suffer from recurrent constipation associated with liver disease, Black Root may help solve the problem as well. According to Kings Dispensatory one can benefit from using Black Root in psychological depression, giddiness, drowsiness, severe pains in the liver area, tenderness, stubborn headaches, yellowish skin, white-covered tongue, sickness, cold extremities, bitter taste, thirst with no capacity to drink, low spirits, weakened portal circulation, clay-colored discharge, half-digested passages, insomnia or bad sleep, and diarrhea. 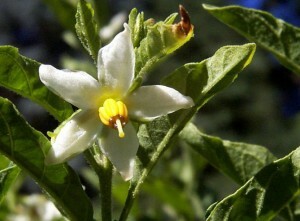 Additional Info: The plant is predominantly found in North America. It gained its popularity in Europe thanks to Seneca Indian tribes. A slim stem the rhizome produces may reach 5 feet in height. The white-colored little flowers are gathered in panicles which form small groups. The fruit is compressed, oblong and is rich in seeds. The rootstock is best for collection in autumn. Use it in a year after digging it up from the ground. Preparation and Intake: To prepare a decoction, take 1-2 teaspoons of dry herb extract, fill it up with cold water and boil up, leaving on low heat for 10 minutes. The decoction is used in a quantity of 1 cup thrice a day. In form of tincture the herb is used in a quantity of 1-2 ml thrice a day. Commonly mixed with: Black Root is mixed with Dandelion and Barberry. For treating hemorrhoids the plant is used together with Stone Root. Safety: Fresh root can produce poisonous effect and should not be taken orally. Only dried rhizome is safe. Exercise care when applying the plant. Due to high eptandrin content it may produce an excessively strong laxative effect and cause vomiting. Consult your health-care provider before application. Daily tea dosage is limited to one cup to stay safe.